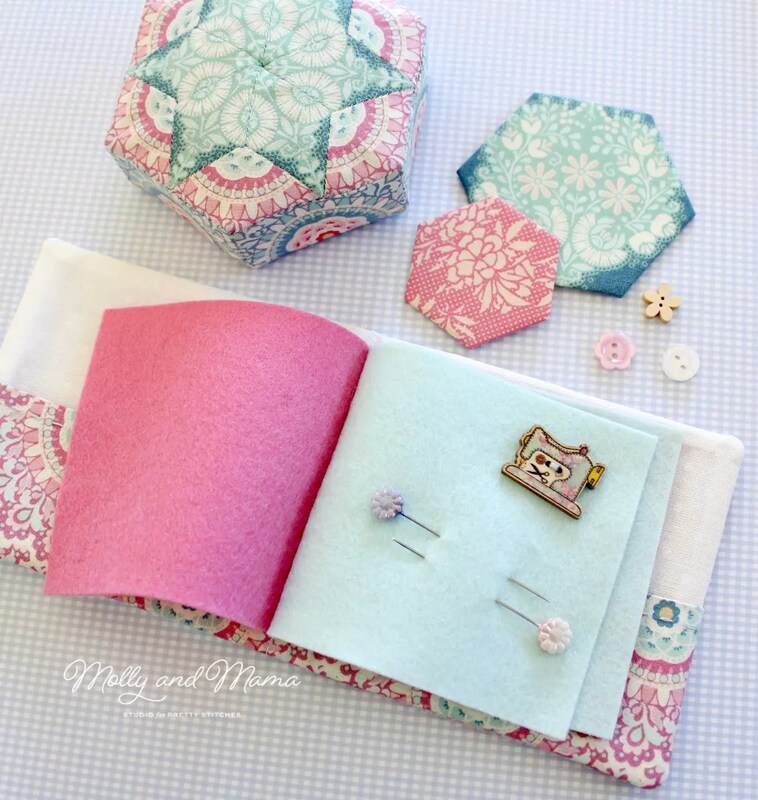 Welcome to my stop on the Quilting On The Go: English Paper Piecing * Book Tour! This brilliant new book from Sharon Burgess of Lilabelle Lane Creations is published by Tuva Publishing (who is also publishing my own book!). When Sharon asked if I wanted to help her celebrate the release of her book, I was thrilled to join in. If you’ve been following me for a while, you’ll know that I am really enjoying English Paper Piecing! And this is Sharon’s absolute area of expertise. 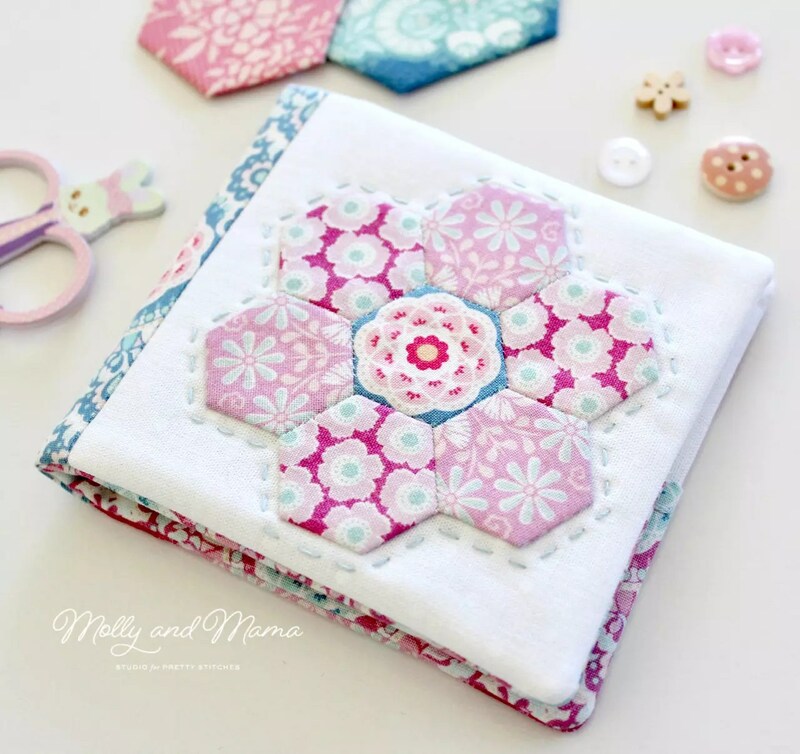 So it’s only right that she created a book sharing all of her tips and tricks, to teach us how to create amazingly intricate and beautifully fussy cut paper-pieced quilts and more! 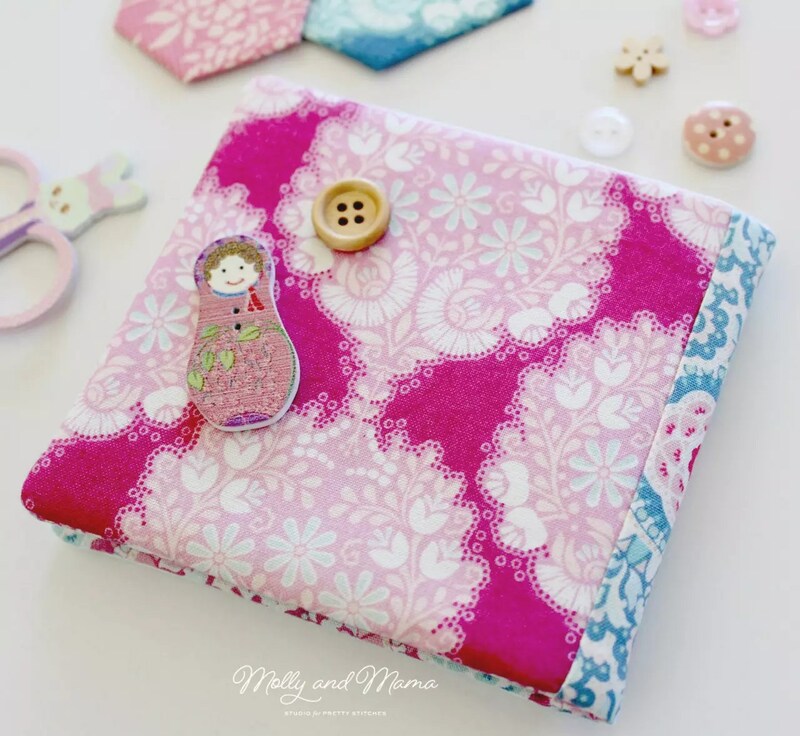 ‘Quilting on the Go’ is a wonderfully presented, large, bright, glossy, craft book that is filled with gorgeous English paper pieced projects. 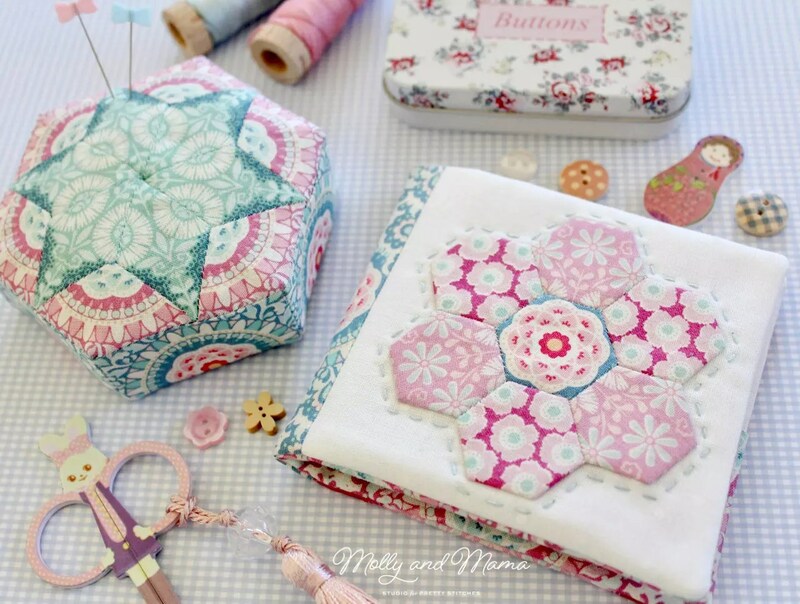 Sharon’s signature style is featured in her beautifully intricate quilt designs. 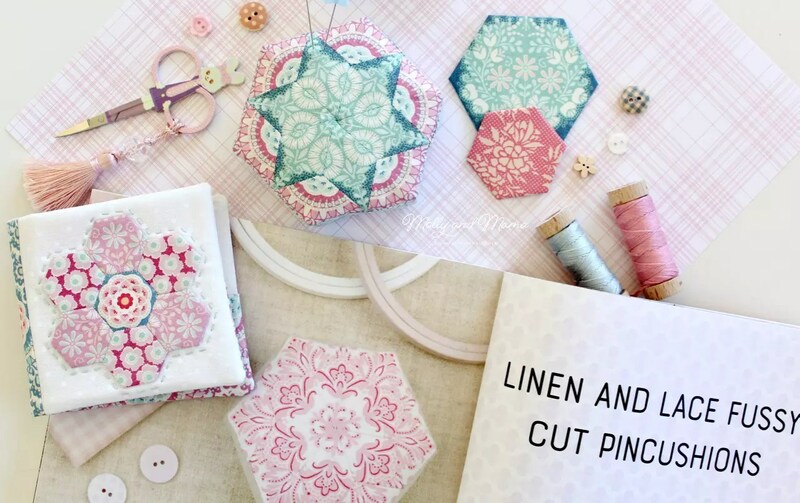 But if you’re looking for a little project to get you started with hand piecing or fussy cutting, there’s lots of other lovely pieces to sew. 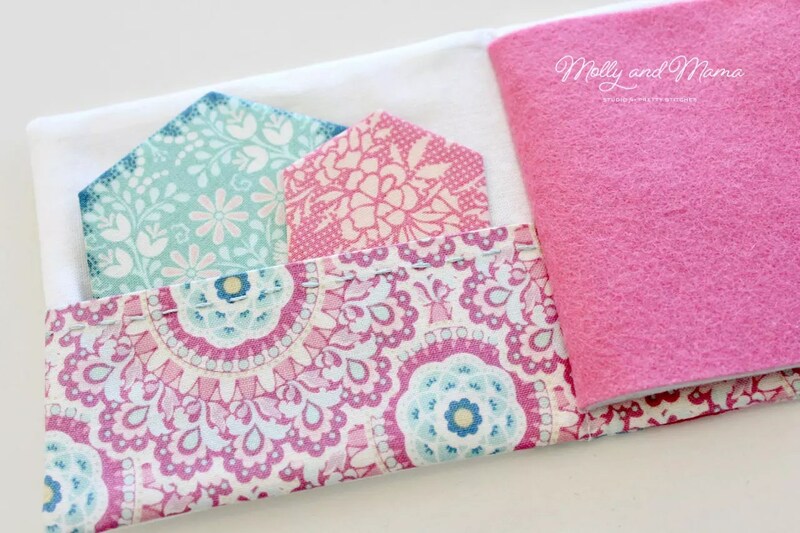 Practical items like a cushion cover, table runner, diary cover, needle book and placemats, will always be popular. But I also love that Sharon included some extra special designs like the fully operational Hexagon Clock, and the Zipper Pouch with rose gold accents! I loved the Techniques in Sharon’s book, especially the section on Fussy Cutting. Being fairly new to fussy cutting, I wanted to really give this technique a try. So I decided to start with the ‘Linen and Lace Fussy Cut Pincushions’ on page 109. I had also been longing to try walnut shell as the medium for stuffing my pin cushions. I knew this design would be ideal for it. The walnut shell gives the pin cushion a beautiful weight and it fills the shape nicely too. I love how it turned out so I’ll definitely be using it again! Now there’s not much point having a lovely pin cushion without a matching needle book, so I also made the ‘Sew Sweet Needle Keeper’ on page 96. It’s only tiny (just over four inches square), but the fabrics really help the design stand out! 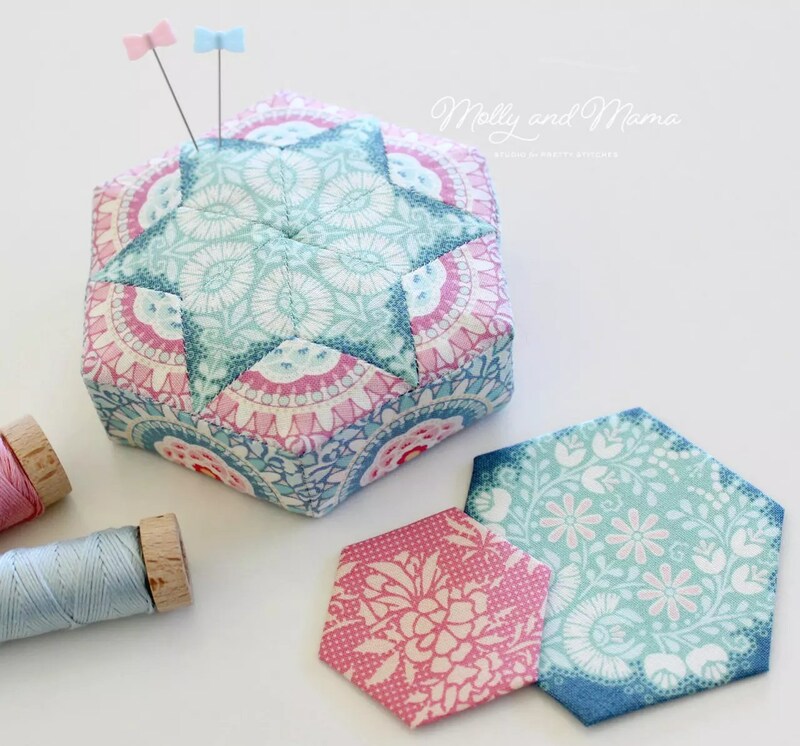 The inside has pockets which are perfect for storing little hexagons! And the wool felt sheets inside will carefully store and protect needles and pins alike. Even the back cover is made pretty with some careful fabric placement! The blog tour started back on the 1st of July, so you’ll be able to look through the list below and go and see what the other talented designers and makers have been creating from Sharon’s book. You’re sure to be inspired! 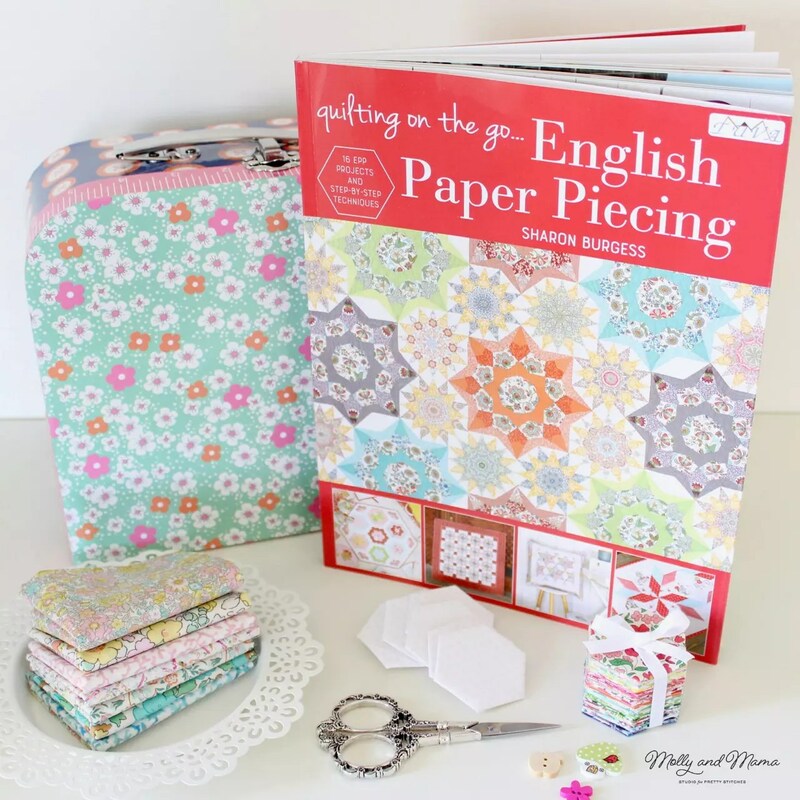 And if you’ve been wondering whether to buy Quilting On The Go: English Paper Piecing* then I can’t recommend it highly enough! EPP is totally different now–thanks to this book! NEAT PROJECTS! THANKS FOR SHARING ON THE BOOK TOUR!!!! In the past few months, I have become very interested in English Paper Piecing. Although, I must admit, I have not gotten enough courage to actually try it yet, I have been pinning information, tutorials and patterns like crazy. I think your projects are fabulous and would be so much fun to make. Thank you for sharing and have a great day!